Its mango season in Kenya and most people just love to have them for breakfast,lunch and dessert. Its like anytime is mango time. Kenya grows some very good varieties of mangoes such as boribo, dodo, and apple mango to name a few. Most of these mangoes are grown in the coastal area. While boribo is generally lemony yellow in colour and a bit fibrous,it is good for salads, cooking and refreshing juice and a popular choice for most because its the cheapest. Unripe dodo is generally used for pickles, achar, cooking, eating with chilli while the ripe one is used for mango juice and aamras. The king of mangoes, the apple mango is sweet, orangey and not fibrous… the perfect choice to serve with ice cream, to have on its own or to use it for desserts. So I thought, why not make some mango muffins. I baked some this afternoon for the first time and they have turned out pretty good and are eggless. Since I baked these muffins for the first time, I have come across many more mango muffin recipes. I prefer the recipe that I use at the moment as the muffins are made from wheat flour. I will leave the original one and add the wheat flour version too. Sieve flour, baking powder, soda bicarbonate, cardamom powder and salt in a bowl. In another bowl, add mango puree, sugar,vanilla essence and oil and beat well till the oil is mixed well into the puree. Add the dry ingredients to the puree and mix till it just becomes wet. Don’t over mix otherwise the muffins will not bake well and will be heavy. Line a muffin tray or muffin cups with paper cups. Fill the cups 3/4 of the way with the batter. Remove from the oven and put the muffins on a wire rack to cool. Mix the jam well till its a bit runny. Brush the muffin tops with it. Sprinkle the coconut over it. Line a muffin tray or moulds with paper cups. Mix flax seed powder and water together. Let the mixture rest for 10 minutes. Sieve flour, salt, baking powder, soda bicarbonate and cardamom powder together into a bowl. Mix in the coconut. Put the mango puree, oil, milk, sugar and flax seed mixture into another bowl. Whisk the mixture for a few minutes. Add flour mixture to the liquid mixture. Mix till the flour becomes wet. Don’t over mix. Add chopped mango and mix gently. Spoon the batter into the prepared moulds or tray. Fill each on ¾ of the way with the batter. Sprinkle the chopped almonds over them. Bake for 20 -25 minutes or till done. Insert a toothpick, skewer or knife into the middle of a muffin. If it comes out clean they are done. Remove the muffins from the tray or moulds and let them cool on a wire rack. If you do not like cardamom, use ginger powder. Ginger powder compliments mango very well. Remember ras, rotli. Mango ras with a pinch of salt, ginger powder and ghee! Can top the muffins with fresh cream and tiny pieces of mango to serve as a dessert. ⅓ cup is about 5 tbsps plus 1 tsp. To check if the muffins are done, insert a wooden toothpick in the centre and it should come out clean. Oh those look yummmy!! I want some!!!! what the muffins or the mangoes? I can bake the muffins when I come to bangalore. The mangoes…. sorry, you need to come here. Just read this recipe and though perfect – I have the ingredients already! Muffins are in the oven now…. fingers crossed! These mango muffins look yummy.. love the texture of these muffins..
Mango flavoured muffins must be tasting Divine.. I love the mango flavour . Never tried in cakes.. I love any thing vth mango…yummy cupcakes. Mango muffin looks delicious perfect treat. Love anything with mangoes. Good one. Love mango flavored cake and these look spot on ! Oh yumm! 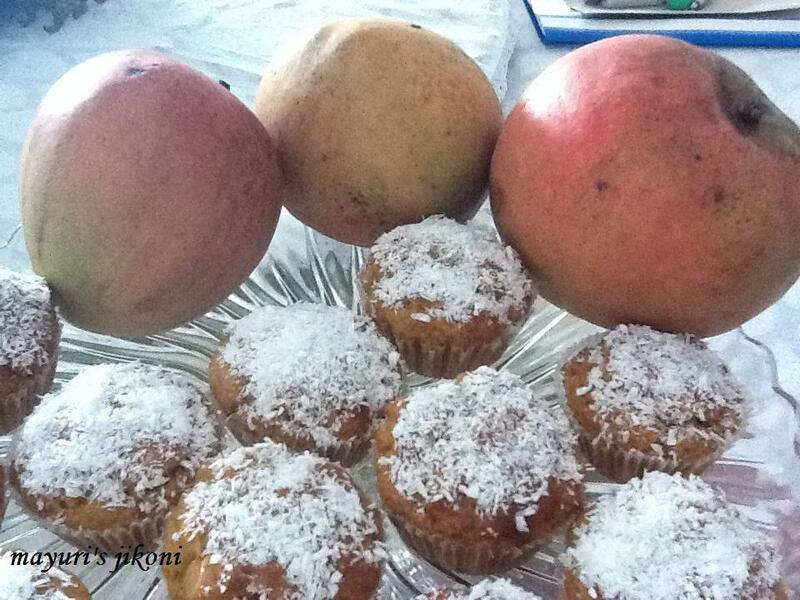 Muffins look scrumptious and flavor of cardamom must be pairing so well with mangoes! What yummy muffins with mango Mayuri. They look delicious. Anything with mangoes are my weakness, would love to enjoy this muffins during anytime of the day. OMG! Muffins look yummy Mayuri. How I will love to grab some of them. loved reading about the delicious mangoes at your place. Mango is my favorite in baked goodies. Looks so PERFECTLY BAKED and yummy. I too love mango and cardamom flavor. Easy to bake Priya, try them when you get some mangoes. They do Priya… the house smells so good whenever I bake them.